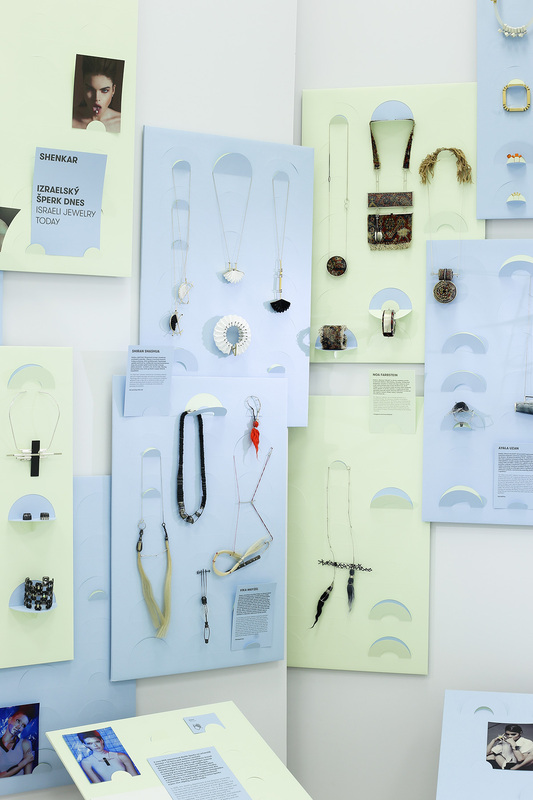 designSUPERMARKET presents the exhibition Shenkar: Israeli jewelry today that we prepared together with Danica Kovářová, a curator of design and architecture and an editor-in-chief of Dolce Vita magazine. 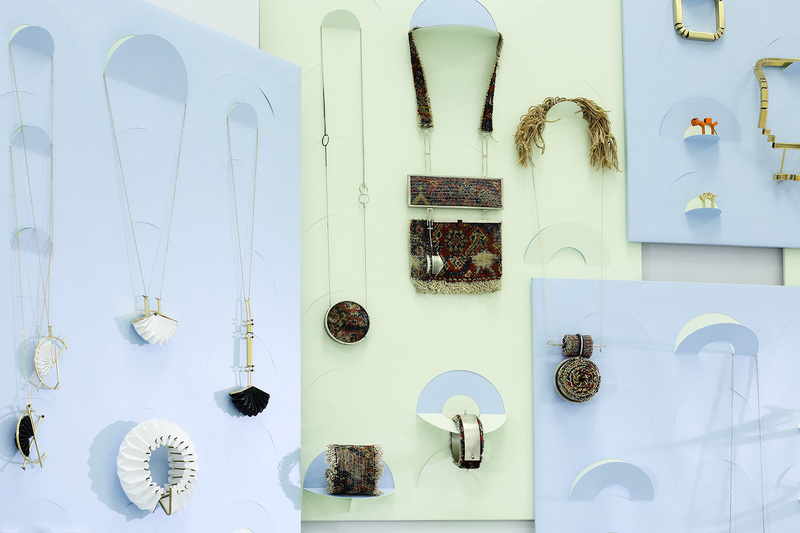 In a special installation by Matěj Činčera and Jan Kloss, in which paper Colorplan plays the main role, we presented collections by seven graduates of the prestigious Shenkar university in Tel Aviv. The collection “Don’t be a Square” refers to several inspirational sources. 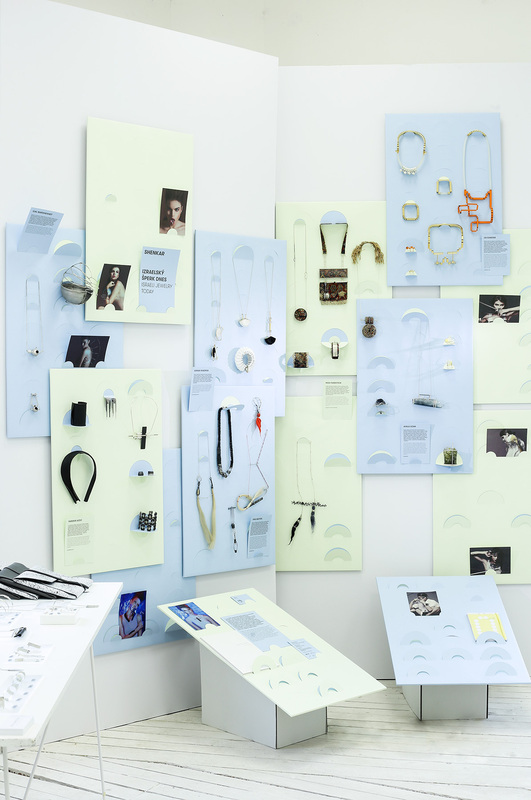 Lia Elnatan has recently graduated with a Bachelor of Design (Jewelry) at Shenkar College of Engineering and Design. 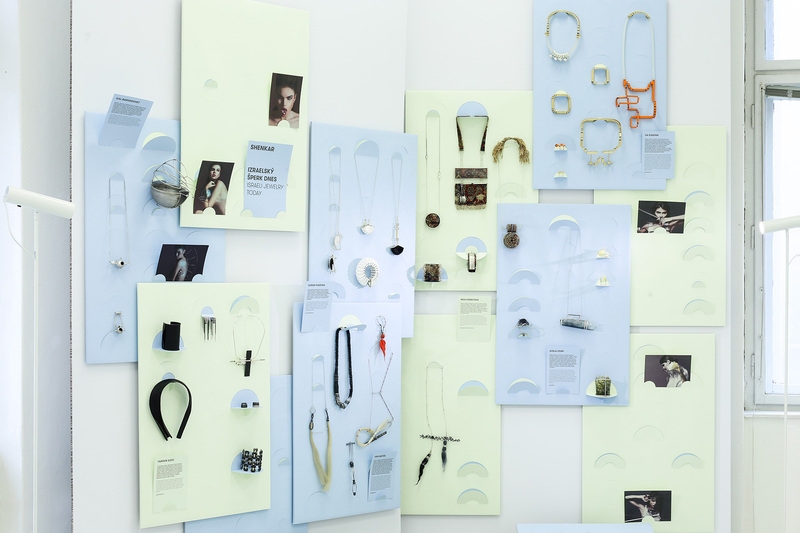 Her inspiration derives from architectural structures that through her jewelry create a bold new world for the wearer, giving them a sense of innovation and uniqueness. It also derives from the well- known 80’s computer game Tetris, and also from monumental royal jewelry from ancient Egypt. Lia has created the jewelry by disassembling a pipe, which she has changed into geometrical objects thanks to cuts under di erent angles. She did so thanks to using mathematical equations in order to be precise and to respect the ergonomics of the human body – to make these objects wearable. The “Split Ends” collection combines two contrasting materials – split and sculpted brass pipes and premium handmade paper. Psychology refers to the split or cut as a mechanism of defence, designed to help us deal with an emotional conflict and with which we absolutely divide into good or evil, black or white. All jewelry in the collection is handmade and combine the seemingly incompatible. The “Knocking on the Wood” collection is inspired by superstition and the national Georgian folk costume. “Each piece of jewelry from the collection in inspired by stories that are passed down for generations in my family. To Georgia, where my grandparents, as well as many other Ukrainian Jews, were evacuated during the Second World War to be spared from the Nazi threats. They have never spoken much about this time of their life, so I decided to fill the gaps in my memories.” The jeweller has used material such as glass, horsehair or garnet stones. The choice of colors, form and ancient metalworking technique called the Repoussé has all been inspired by the Georgian national folk costume. The “Monomental” collection is inspired by aerial photographs of railroad tracks, which Yarden studied thoroughly. She has been fascinated by the moments when their lines unite. Such profiles and functional and mobile junctions can also be found in the human body. The second part of this collection presents Swarovski crystals that have been set in jewelry without soldering. The colors are monochromatic and solely black and silver appears in the collection.